As I theorized in one of my posts last year, I strongly believe that Old Cob is going after Grandmother Raven. Or at least he's trying to hurt her in some way, for trapping him in the Hive for so long. 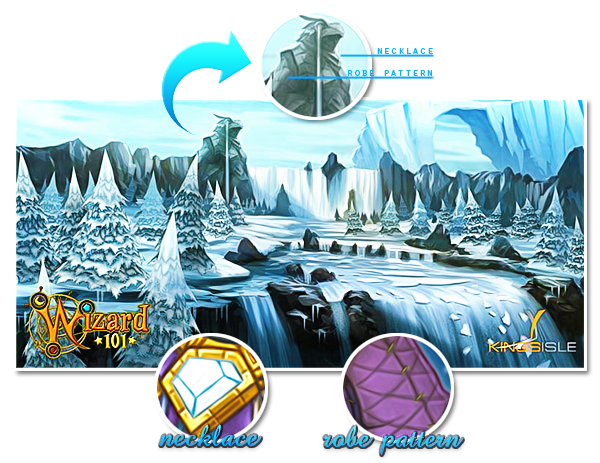 Earlier today, KingsIsle revealed another Polaris concept art teaser, which showcases a coniferous forest covered in snow, surrounded by mountains, with a river flowing in the middle. The interesting bit about this specific concept art is that you can see a giant statue of Lady Nightstar, better known as Grandmother Raven, in the background, and she appears to be crying. Some people were skeptical about this actually being Grandmother Raven, but I have outlined the similarities between the statue and Lady Nightstar in the picture below, and that should help clear the confusion (click to enlarge). The existence of such a monumental statue in Lady Nightstar's honor shows just how important she must've been to Polaris and its people. 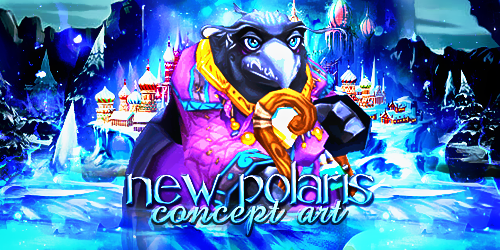 The way she was drawn and the fact that she's crying supports the idea that Polaris is in danger, and I wouldn't be surprised if Grandmother Raven is the one who holds the Spiral key to this magical land. I'm guessing she once was the protector of this place, but things changed when she was trapped by the Coven, in Wintertusk. What did you think of this new sneak peek? Are you excited for Polaris? Leave a comment below and let me know.